When I decided to try my hand at the Blogchatter A2Z challenge, I didn’t really have a clue of what a Blogging marathon was and what it took to come out successful at the end. Towards that, my journey through this has been totally one of learning and full of positives, as it has been of crazy fun and of an exhilarating writing adventure. When I announced that I would be writing on Ancient Cities of India with their historical and mythological references, many around me opined that I was selecting a difficult theme for myself. But then, I had just completed reading a couple of history-based books and had also written a six part series, in my own blog https://sayanwrites.blogspot.com/, tracing my very own family lineage to the ancient lost city of Kanyakubja; an exercise which had deeply immersed me in India’s ancient history and mythology. Thus at that time I could think nothing beyond India’s ancient history. To me, it was also a means to re-live and wallow in the rich heritage of our country, explore the cities and eras of the past and what better than to be able to narrate some of these stories to my readers and better acquaint them with the ancient cities that we would have read about in our history books in school. Thus was born the concept of ‘Ancient Cities of India’ as a compilation of light-reading historical tales, and across a gruelling April, as I toiled in my research and continued to write about the ancient cities, it expanded to include stories of 25 Ancient Indian cities and some traveller and historian accounts. The endeavor was to export the reader back in time to many of our famous ancient cities and re-tell the history and fate of imperial kingdoms and mighty kings who ruled our land. Vivid descriptions of battles which changed the political, economic, geographical and social fabric of the country across the eras. Also at one point, the attempt was to explicitly identify and recount the era when time crosses over from what is classified as mythology, to the better recorded ancient history of India. I am glad that throughout the duration of the Blogging challenge when these stories continued to appear daily on my blog, and the weeks even beyond, they have received good readership, encouraging comments and appreciative reviews from readers and veteran bloggers alike, and have been shared widely on social media. 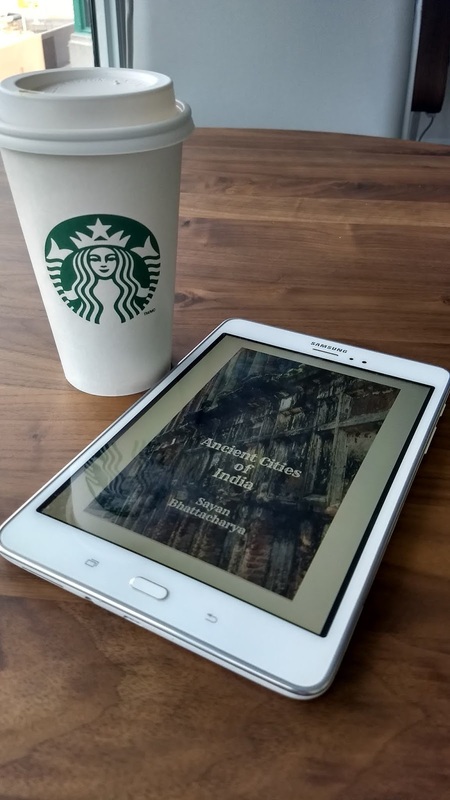 Finally, at the end of the marathon, the compilation “Ancient Cities of India” saw itself published as a successful eBook. I truly owe my thanks to the Blogchatter team and my readers across different virtual mediums for generously encouraging this exclusive eBook. Stories of imperial kingdoms and tales of valour of kings have always been recorded in history, first orally by the bards in the royal courts, then in scripts by chroniclers and historians, until in the last few centuries via printed books authored by scholars. Mighty kings like Ashoka, Harsha, Akbar and Shahjahan find themselves entrenched in such pages forever across the centuries, but would they have fancied finding mentions in an eBook of the digital era? !